The fourth annual Crème de la Crème Ball took place on Saturday 14th September in the grounds of Warford Hall, the private residence of the event hosts; Ashley & Dawn Ward. Hundreds descended upon the starlit Marquee for what has become one of the most prestigious events in the Cheshire social calendar. 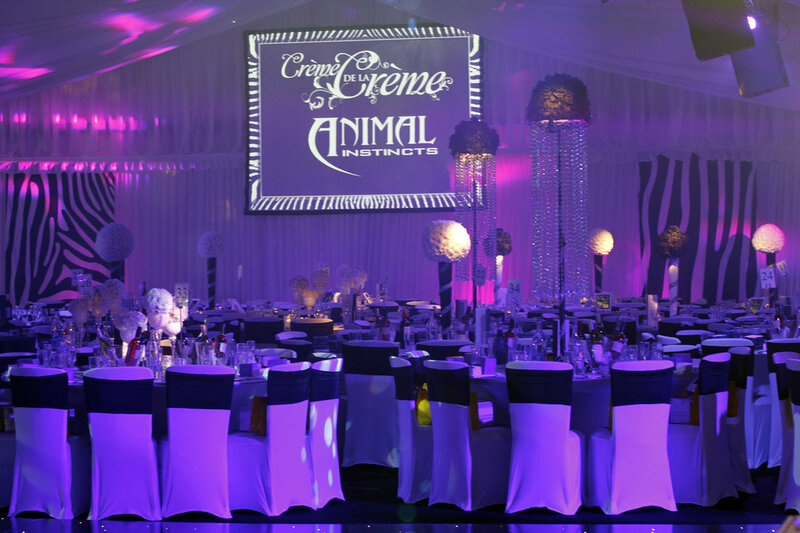 Organised by Entertainment Today Events Ltd, this year the glamorous event turned wild with its Animal Instincts theme. Guests were greeted by giant stilt walking zebras and models dressed as panthers and lions. The red carpet was buzzing with the glitz and glamour of the occasion with stars attending in abundance. The VIP guest list included Coronation Street stars Kym Marsh & Simon Gregson, Waterloo Road’s Chelsee Healy, Emmerdale’s Charley Webb, Sammy Winward & Sheree Muphy along with Premier League WAGs Coleen Rooney, Alex Gerrard, Kaya Hall and Hayley Fletcher. Guests entered into an atmosphere not dissimilar to Ibiza’s Zoo Project, with a live saxophonist accompanying the deep house music. Guests were entertained throughout dinner by Britain’s Got Talent finalist and super-talented impressionist Francine Lewis; upcoming girl band The Vixens and X Factor finalist Christopher Maloney who debuted his first UK single to the sold-out crowd. The event raised over £140,000 for children’s charity: Caudwell Children who provide family support services, equipment, treatment and therapies for disabled children and their families across the UK. They also run the Enable Sport programme for talented disabled athletes and the Destination Dreams holiday for children fighting life threatening conditions. Darby Ward, daughter of Ashley & Dawn took to the stage with Jonathan Bremner to perform a self penned song with lyrics which conveyed the life of the children the charity sets out to help. Keeping it a family affair, Ashley and Dawn’s second daughter, Taylor, teamed up with Key 103 DJ Darren Proctor to compere the event. Headline act The Wanted performed a series of their chart topping hits to a packed-out dance floor and Crème de la Crème regular Ruth Lorenzo finished off the live entertainment with a stunning selection of rock classics including her trademark X Factor song Purple Rain.